The unique, patented UNIDIRECTIONAL AIR FLOW Tramontana® technology is included in the 2014 VB-series. The VBS Quick Flow (“S” standing for application on SILOS) has been fully reviewed in order to satisfy current market needs. Along with a variety of membrane materials, the new design has considerably improved the performance of OLI Vibro-Aerators. An important step ahead in aeration technology, the VB-series meets virtually every user’s requirements in terms of versatility in use for various powdery materials, protection of the environment and temperature range. Lower operating pressure and reduced air consumption are the main benefits. An external mounting kit makes the VB-series interchangeable with aerator pads which are commonly used in mobile batching plants. 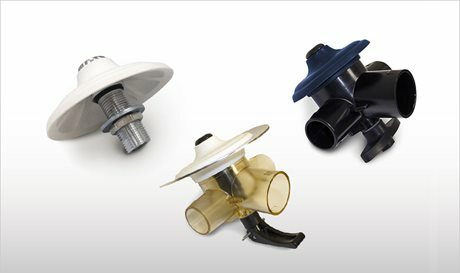 The Mini-VB series, for both internal and external assembly, completes this product line. VBT Quick Flow (“T” standing for trailer application) completes the range as an innovative solution for Bulk Tanker Trailers. The entire VBT line is food-grade and UL94-compliant. These Aerators are manufactured from high-tech polymer suitable for environmental conditions ranging from extremely hot to extremely cold. Laboratories and field test have given proof of high efficiency in terms of reduction of tanker unloading time of around 20%, depending on the type of powder. VBT Quick Flow is completely interchangeable with other aerator makes currently present on the market.